Lazare Kaplan believes that diamonds represent something unique and precious, that the finest diamonds are a symbol of the absolute best nature and man can create together. 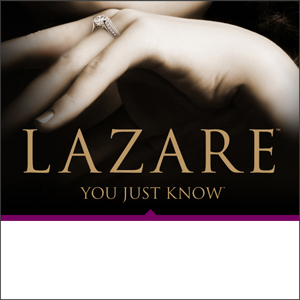 Lazare does two things: first, it educates customers – not only to teach what comprises the best diamond, but also to alleviate much of the uncertainly when buying a diamond. Lazare’s easy to use 4C’s app demonstrates cut, color, clarity and carat weight through easy-to-navigate videos and side-by side comparisons. Deleuse Jewelers will help you understand diamonds so you may make a selection with confidence. Second, Lazare brands each ideal-cut diamond it creates. Invisible to the naked eye, the signature inscription serves forever as a positive proof of authenticity and ownership. Asking for Lazare by name assures customers that they are getting a diamond of the highest quality. Every diamond is cut to ideal proportions and adheres to strict tolerances that govern color and clarity. For the discerning customers the uncompromising quality of cut, found in a Lazare culminates in a satisfied purchase.